As technology makes communication easier, organizations are becoming more globally integrated. Executives now expect employees in different locations, departments, and business units to band together to meet client demands, solve complex problems, and innovate. This level of collaboration is predicated on the idea that employees can develop networks of trusting relationships that bridge any gap, be it geographical, functional, generational, experiential, or cultural. 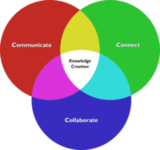 Using input from prominent knowledge management (KM) program leaders and APQC research, APQC’s 2011-2012 KM Advanced Working Group (AWG) examined strategic and tactical concerns associated with collaboration in the global workplace. This white paper summarizes the AWG’s conversation, outlining key opportunities and challenges for creating a seamlessly collaborative organization.